Sad not even 10% show up for nationals. I wonder out of the 7696 how many are current shooters? Maybe a breakdown of classification? How does indoor nationals compare? Christopher Miceli wrote: Sad not even 10% show up for nationals. I wonder out of the 7696 how many are current shooters? Maybe a breakdown of classification? How does indoor nationals compare? Perry 642. Canton 220. 90%? New math? Denny, thanks for sharing these numbers. Your participation and transparency on this board is refreshing and always appreciated. Zjohn bickar wrote: Denny, thanks for sharing these numbers. Your participation and transparency on this board is refreshing and always appreciated. The length of the Nationals is their length, I don't think that the length and vacation usage or cost is the total picture. If you compare HP rifle to what's happening in pistol, you have a growing competitor base and more events. There 3 weeks of shooting if you do it all. Pistol hasn't added much in a long while. CMP has added 22 EIC & DR while NRA has added Harry Reeves. Last year only a third of Perry competitors shot the Reeves. I imagine that few shot the DR event for CMP. I don't have the answer, but I fear that bullseye will wither if something isn't done. Well its all about getting those Commons into the sport, and that means making it more appealing for them. Do I want that...no but more people will be better for everyone except for the diehard old rule people. DR is NRA not CMP. So they did add that also. DirComp wrote: I had these numbers run this afternoon. FYI, these are the number of classified competitors in our files. Any other numbers that you care to see? An anecdote is not data, and I haven't actively shot iron sights (metallic) since 2014, but if I shot a 2700 tomorrow with irons, I would enter as open, not metallic, because I wouldn't want to make more work for the guy running the match. Your metallic and production numbers might be under-represented. Nobody knows how to report them. I agree with John that metallic numbers might be under-represented. I shot 3-2700s last year metallic and have never received a new card. They were recorded in the match results as metallic but then nothing ever happened. Oh well..
More shooting at the Nationals does not equal more competitors at the nationals. More Divisions does not equal more shooters. More local matches does equal more opportunities to get more shooters participating. However "more" does not necessarily mean "better" in any of these cases. Precision Pistol, Conventional, Bullseye, whatever you call it will only be an interesting sport (and therefore participation therein) by an interesting few. Bullseye did not loose shooters because it did not change. It lost shooters because it used to be the only game in town (for locals since Olympic was very small) and you played it or pretty much just shot for fun. When action pistol (Metallic Silhouette, PPC / IPSC / USPSA / Bowling Pins / Practical / Cowboy; etc.) finally got started; shooters found things about those sports that attracted them because while they shot Bullseye, it was not their passion or preferred sport. And I've shot every one of those listed above. Pre 1960 and even most 1970 literature on pistol shooting is either hunting, trick, PPC or Bullseye. Things change, but you will have to admit that bullseye shooters today have more equipment, guns, services and other doodads than were ever available before. Things change, Cowboy used to have 75 - 100 shooters at our range. They are now back down to 20 or so. Things change, Bullseye has increased at our local matches about 50 to 100% over the past 5 to 10 years. That has happened very time there is an interested person running the local matches. Every time some has not been "interested" or was just putting in the time, match participation has waned. Thanks to all the guys that are putting on matches. Don't let this crap about loosing shooters get you down or imply you're not helping, or get frustrated that everyone is only interested in the Nationals, how many divisions they can try to get a gold star in or how many times they change the rules. Match Directors, RO's for matches, Stat office people, anyone calling the matches, regular shooters putting on "bullseye" matches at local indoor ranges; YOU are the ones that are growing the sport. Don't give up, it takes time and effort (as sometimes some hollering at the club meetings), but if you build it, they will come. 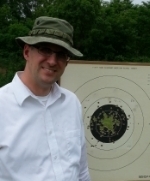 Most of our local new shooters come from the fact that some current Precision shooters are putting on local, non-NRA, informal bullseye matches at local indoor ranges. The shooters that get "hooked" then show up at the full matches. Maybe the NRA needs to get someone at the local indoor ranges if they really want to grow the sport! Everyone seems to be trying to come up and top each other with the "next best thing for bullseye". Shooters at the local level promoting and doing the work are the next best thing for bullseye! Thank you very much for all your efforts! ... and Cecil is one of those great people who is a Match Director at a local club. Thank you Cecil! I've only been pistol shooting for a couple years -- it's a retirement hobby. It wouldn't be possible without the Match Directors (Cecil & Clark) and the local informal Bullseye League director (Willie). I can't thank those guys enough for the work they do to enable the local shooters to enjoy this wonderful sport. OldMaster66 wrote: I agree with John that metallic numbers might be under-represented. I shot 3-2700s last year metallic and have never received a new card. They were recorded in the match results as metallic but then nothing ever happened. Oh well.. Send me a PM with you info and I'll look into it. Cecil is correct that there are problems with getting local people to run the matches. It's happening everywhere and the various committees have changed the rules so that many of the match officials can now compete, as well, hoping that club members will help conduct the matches and compete. I just received an email from a member of the High Power Committee lamenting the same thing, adding that those matches he can attend have seen the quality of the events declining. It is very difficult for the NRA to become involved in correcting this, especially since the number of alleviated clubs exceeds 12,000, let alone those that aren't affiliated. The NRA Pistol Department consists of One (1) person, who is responsible for both Precision Pistol and Action Shooting. He has one support person. He is also responsible for running both championships, the Bianchi Cup and Precision Pistol. With two national championships on his plate, he doesn't have much time for other duties. The numbers that I posted at the beginning of this thread were for information only. I thought you might like to know how many people are involved in our sport. It was not intended as a comment on anything nor was it intended to generate any follow up conversation. Thanks for the info. I think the numbers really help us understand where we are. The additional conversation is a good thing. How many clubs hold NRA Sanctioned "Precision Pistol" events, and how many events are held? I agree that participation needs to be fostered at the local level. Just like improving my/our scores nothing will happen unless I/we have some goals. I ask the above 2 questions trying to understand what it might take per club to get the local participation numbers (unique competitors) above 10,000. I know a fair number of "competitors" who only shoot a weekly league, or have a competitor number because they shoot a particular 900 match once a year that requires a competitor number. Otherwise these shooters never see a 2700 match much less Canton or Camp Perry. Many of these shooters live close to multiple monthly 2700 matches but don't compete. I've offered to drive, even offered the loan of guns and ammo. The reasons I been given are varied, but mostly they complain that a 2700 match is too long. The reasons I been given are varied, but mostly they complain that a 2700 match is too long. Unless I've filled all of the spots on the line (2700 shooters get 1st dibs), I allow shooters to shoot as few or as many strings as they wish. Check with your match directors to see if they are open to that. Dennis: years ago the field representatives aided the local clubs amongst other things. Now they seem to be focusing on Friends of NRA events. Perhaps more field reps can return to aiding local clubs hold matches. I'm not sure how many clubs host 2700 matches but can probably find out when I return to work on Monday. Field Reps did work with the clubs and did a lot of good. Even some members of the Board of Directors lament that they now are focused on Friends of the NRA stuff. That has been discussed but I don't know where it's headed. Above my pay grade. The length of the matches might be an issue. My son grew up with 2700 matches, accompanying me to matches since he was about 8-9 years old. He later became a Master Class, Distinguished shooter in his own right. He stopped shooting to raise a family and about 4 months ago I asked him if he was going to return to competition. He said that he would not. When I asked why, he said that it took too long. He has sold his reloader and I think is about ready to sell his guns, equipment, and left over ammo/bullets. It's a shame to lose him but I understand. His kids are only 8 and 4 and he wants time with them. One solution is to hold more 1800 events. But years ago at a local club, they had a weekly 22 pistol shoot. Indoor at 50 ft and no prizes except bragging rights. So we'd all rush there at 7 pm and shoot one N M course. In and out by 8. I suggested that we at least double the course to 60 shots and we did that. Even then we were in and out by 830 pm. After a year or two I suggested to some of the members that we form a team and enter the upcoming regional. Most declined saying they "weren't good enough". I don't think they ever shot anywhere else.